After hearing the news that Kevin Smith will make Clerks 3 before retiring, I decided to revisit his movies. So here is the first of three parts examining his filmography. I’m only including the ones he wrote and directed, so Cop Out won’t be included. Let’s get started. Clerks. (1994) – Buy on Amazon by clicking here. 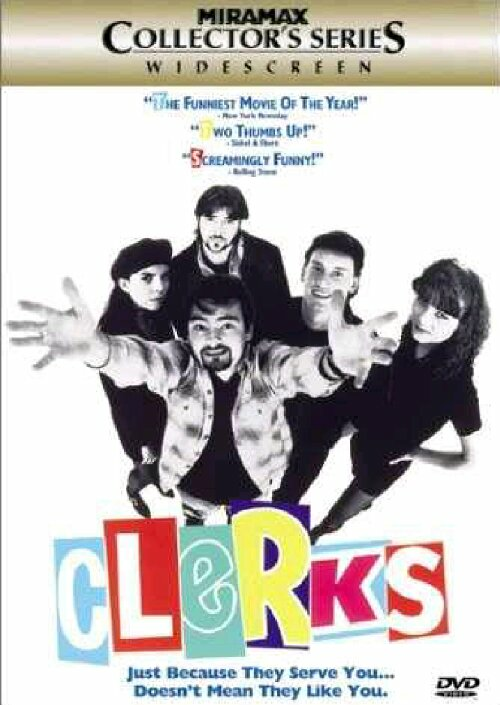 Clerks is a great slacker comedy and a terrific introduction to Kevin Smith’s voice as a filmmaker. 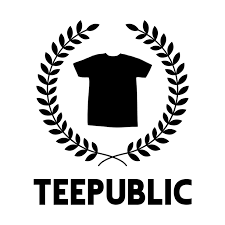 It reaches deep into the pit of immaturity to provide plenty of unpredictable laughs. Among the absurdity, the movie provides an honest look at the stagnant 20-something who’s resistant to move forward. Dante’s story is an endearing examination of the mid-20s slacker with little to no direction in life. He spends his day complaining about his station in life while not doing anything to try to change it. In fact, he spends his time obsessing over a past love instead of facing his future. The movie is filled with witty dialogue covering the most inane topics and establishes Smith’s style and tone spectacularly well. It’s a rough, risky look at what eventually gets honed throughout a couple decades of filmmaking. Meanwhile, behind the scenes of Clerks, the story of a man putting everything on the line to realize his dream is one that can inspire anyone. Kevin Smith maxed out his credit, sold his possessions and borrowed money from family and friends to finance the movie. Filmed at his actual convenience store job after hours, the movie becomes a passionate tale of inspiration to anyone struggling to realize their dream. Mallrats (1995) – Buy on Amazon by clicking here. Even as far as cult comedies are concerned, I’ve always felt like Mallrats never got the attention it deserved. It’s easy to write it off as “Clerks in a mall” and, in some respects, it is “Clerks in a mall.” But there’s more to it than just being a pit stop in Kevin Smith’s growth as a filmmaker. Jeremy London and Jason Lee play off each other well as two recently dumped mall aficionados, who spend the day at their sanctuary. The movie takes the more absurd comedy from Clerks and cranks it up a notch as the characters hatch elaborate schemes (aided by Jay and a gadget-laden Silent Bob) to win back their respective girlfriends. The script is as solid as Clerks and the story more upbeat. The characters pine after their girlfriends but there’s not as much underlying drama as there was in Clerks. The real entertainment is seeing what Smith does with a little more money. What he did was create an overall fun movie with plenty of absurdly hilarious gags. Chasing Amy (1997) – Buy on Amazon by clicking here. Chasing Amy afforded Kevin Smith fans a well timed opportunity to see the filmmaker stretch his creative muscles. It’s a very different movie than his first two, trading in slacker comedy for occasionally poignant romcom. The new approach works very well as we’re left with an emotional and unique love story made complete by Smith’s personal touch. The story takes a typical “man falls for girl” romcom plot and complicates things by making the girl a lesbian. It’s a unique concept and Ben Affleck and Joey Lauren Adams play their parts very well. It’s an interesting look into the complexities of human relationships with surprisingly real emotions at play. Jason Lee’s character provides the shock and obnoxious humor we got a taste of in Mallrats. However, Banky isn’t just a comedic device for an emotional love story. He’s a central figure in the plot and shows the most emotional growth of any of the characters. Chasing Amy is a surprisingly raw romantic dramedy that’s hard not to appreciate. That covers it for part I. Check back tomorrow for part II and my thoughts on Dogma, Jay and Silent Bob Strike Back and Jersey Girl. Make sure you like the blog on Facebook and follow me on Twitter. This entry was posted in Matt Hurt's Columns, Movie Reviews and tagged Ben Affleck, Brian o'halloran, film, films, Jeff Anderson, Joey Lauren Adams, Kevin Smith, movie, Movie Columns, Retrospective. Bookmark the permalink. 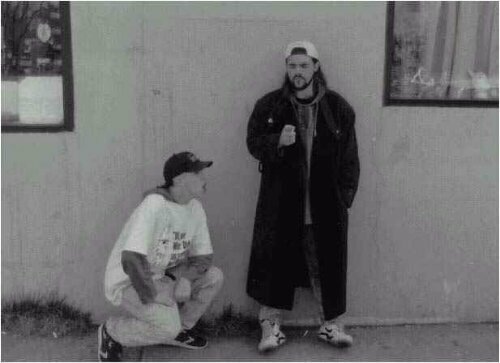 I think I need to watch Clerks again. I was ironing and texting/courting a girl the first time I saw it. I was a bit distracted, and some of it’s subtleties were lost on me. Nice, I recently watched Clerks, Mallrats and Clerks 2 in a row it for sure is some great movies! I agree. I wish Mallrats had gotten a sequel.